On page 174, R.W. 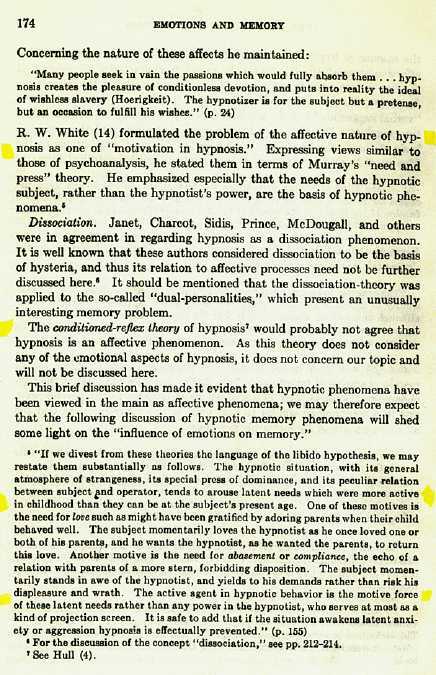 White defines the challenge in hypnosis "motivation". Ferenzi on page 173 asserts "deepest roots in repressed parent complex." reciprocal echo to (Trieb-Einstellung) "drives are phylogenetic survivals." and that the needs of the subject "are the basis of the phenomena." Agreement by the writers upon disassociation's and memory performance of page 174 as well as the conditional, extreme reflex patterns of memory or post hypnotic suggestion are easily created with affective phenomena enabled by transference. Once established as reflex by the unconscious it no longer requires affectivity to become action. It is implied that patterns of behavior can be established over long periods of time by these methods.